I tend not to use vias (I am not familiar with grounding, EMI and etc. ), as the SPI runs at 50MHz. I have the impression that a via from one signal layer to the other will worsen the ground loop. Is the impression correct? Therefore, the following connection is used: A resistor acts as a bridge... The resistor is serial connected for matching purpose. Is this kind of connection valid? I dont like it as well, since the resistors are in 0402 package, which makes the trace through very thin. One last question, should I worry the interference between different signal traces, if the following connection is used (with vias)? "The second component is a high frequency return signal which tries to follow the signal trace on the ground plane. If you switch layers from say the top layer through to the bottom layer on a 4 layer board (signal, ground, power, signal) the HF return signal will as I understand it try to jump from the ground plane to the power plane by detouring through nearest available path (nearest decoupling cap, hopefully... which to HF might as well be a short)." How is the power plane influenced? And why is that?? It should also be related with this post: The best stack-up possible with a four-layer PCB? 1.Signal layers are adjacent to ground planes. Stop thinking about ground planes, and think more about reference planes. A signal running over a reference plane, whose voltage happens to be at VCC will still return over that reference plane. So the argument that somehow having your signal run over GND and not VCC is better is basically invalid. 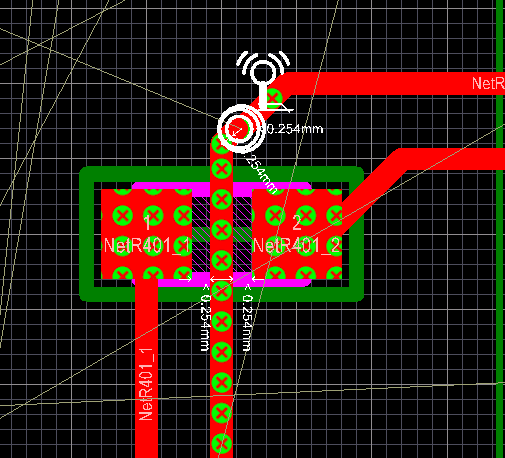 SPI bus at 50MHz can easily run a couple of inches thru a few vias without hitch. Wavelength of 50MHz is 6 metres but realistically because fast edges are used you need to think ten times faster. Even so that's a wavelength of 60 cm. Rule of thumb is keep tracks smaller than a half of a quarter wavelength (other folk will use other rules of course) and this means 7.5 cm or 3 inches. Try and keep clock and data same length and if you hit problems on long stretches you might have to terminate at high frequencies with 10pF in series with 100 ohm (more likely on clock than data). There is no great theory in my answer, just a whiff of theory and some experiences and he odd rule of thumb. Bottom line - use a ground plane - it's no excuse to say you are not familiar with grounding - get familar - it'll be the difference between something always working and something nearly always never working - it's that big a deal. From the comment "Could you please explain how your loop was created? Through an answer with some pictures? It would be helpful to know." That file is partially routed - eg that keepout box was much smaller at the end and the ground connection at top right IC4 wasn't a tiny line etc etc - but it does illustrate what I did. IC4 is a TXS0108 level shifter for the 1.8V lines coming up from the bottom. The power lines are decoupled with the caps to its left. When I did the GND flood the grounds were connected and I said "sure, that's fine". No it wasn't. The blue lines illustrate the path from the caps, off to the left, up around the entire top edge of the board (not really shown - it's another 50% in height), down the right and back around to the GND pin on the level shifter. 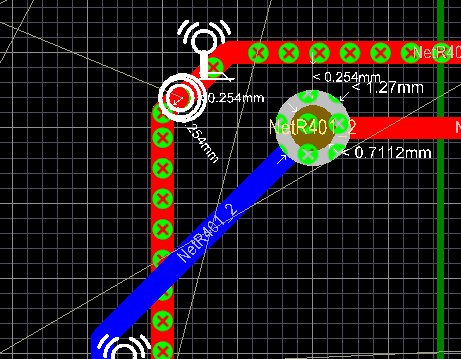 The suggestion shown in the first diagram, isn't a very good idea of routing, since it may produce shorts during manufacturing between the track and pad of 0402 package, if strict tolerance is not followed during production. Since the full routing scenario is shown here, taking the reference from your suggested solutions, it suggest you to follow the second diagram and maintain the track-to-track clearance of 8-10 mils to avoid cross talk between the signal traces. Not the answer you're looking for? Browse other questions tagged pcb pcb-design interference via pcb-layers or ask your own question.